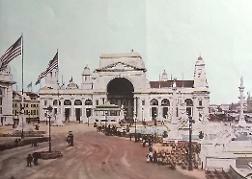 The 1893 Chicago Colombian Exposition had many buildings with various themes. One of the more important was the “International Exposition” held in the very beautifully designed “Electric building” which was devoted to both DC (direct current) and AC (alternating current) electrical exhibits. 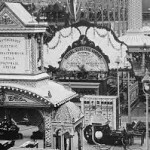 During the planning, two American companies were competing for the bid to light the entire exposition grounds. 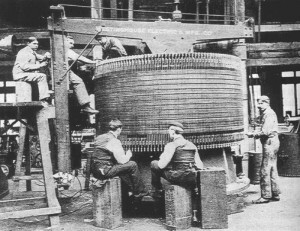 The General Electric Company was backed by J.P. Morgan and Thomas Edison, who had proposed to power the electric exhibits with DC, originally at the cost of U.S. $1.8 million. After this exorbitant profit-making offer was rejected, General Electric rebid their costs at $554,000. 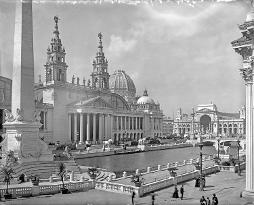 The other contracting bid was proposed by the Westinghouse Company whose design was to use its AC system to illuminate the Colombian Exposition in Chicago. Their bid came in much lower at $399,000. 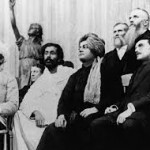 This was the key event and historic point in time that caused what has been famously known as the “War of the Currents“. All of the large exhibits were from commercial enterprises. Thomas Edison, Western Electric, Brush and Westinghouse had exhibits. General Electric decided to ban the use of Edison’s lamps in the Westinghouse exposition lighting plan in retaliation for losing the bid. The Westinghouse company quickly designed a newly patented “double stopper” light bulb and was able to light the fairgrounds. This newly designed Westinghouse light bulb was invented by Reginald Fessenden ( Fessenden later became the first person to transmit voice by radio). He ingeniously replaced Edison’s delicate platinum lead-in wires with an iron-nickel alloy, therefore greatly reducing the cost and increasing the life of the lamp. The Westinghouse Company displayed several poly-phase electrical systems. The exhibits included a switchboard, poly-phase generators, transformers, transmission line, step-down transformers, commercial size induction motors and synchronous motors, and rotary direct current converters (including an operational railway motor). The Chicago Exposition featured Nikola Tesla’s personal presentations with ( AC ) alternating current and several of his electromechanical devices, which included his two phase induction motor and generators to power the alternating current system. 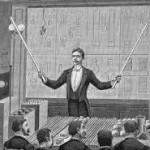 Tesla demonstrated a series of electrical effects, some which were in previous lectures performed elsewhere in America and Europe. 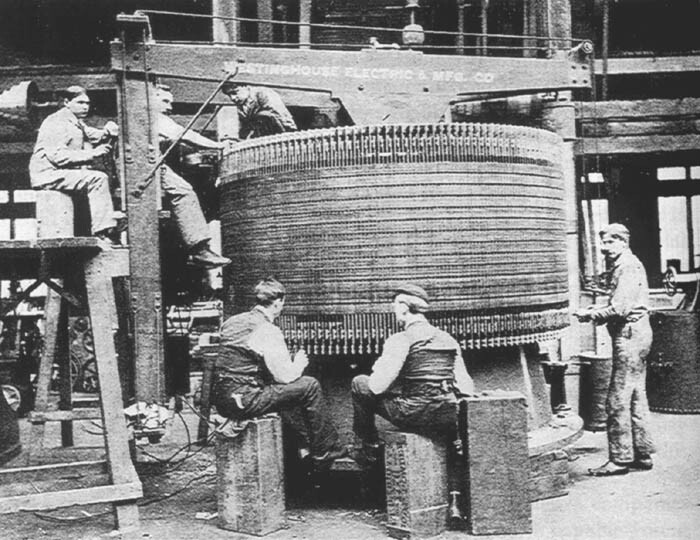 This included using high-voltage, high-frequency alternating current to light a gas discharge lamp.